Half-Wit Inventor Half-Wit Inventor One of the many quest characters that are located around Pascal’s Village, the Half-Wit Inventor asks the player for gears (the in-game currency). If you fund him, he’ll offer you rewards that are equal to the value of the amount you’ve paid him. It’s an odd, little quest, but one that celebrates the curiosity of the player. Grun Grun A large machine lifeform created to destroy androids, Grun was sealed away in the sea for his tendency to attack other robots. During the events of Nier: Automata, however, he somehow manages to return and attempts to reach land. Extraordinarily powerful, due to his electronic magnetic pulse defences, he’s subdued by the scout 9S, after the android fires missiles directly into the machine’s mouth. Masamune Masamune Encountered in the Forest Castle Ruins, below the throne room, Masamune is a blacksmith who upgrades your gear and sells machine weapons. If you speak to him, he’ll also inform you of some powerful swords that can be found across the world map. These were made by his master and were sealed away after his teacher realized the bloodshed that they had caused. Noble and highly proficient in his trade, Masamune is a useful supporting character. High-Speed Machine High-Speed Machine First seen in the City Ruins by a fallen Goliath model, the High-Speed Machine challenges the player to a number of races as part of the Speed Star quest. This activity provides a neat little distraction from the main game, and culminates in a sequence that gives a further dose of humanity to the mechanical beings in the world. If you’re looking for something to do other than blasting away machines and catching fish, the High-Speed Machine has got you covered. YoRHa Betrayers 8B, 22B and 64B are three rogue YoRHa units. Your tasked with detaining them, after they abandon their post and start causing problems for the Resistance forces on Earth. As it turns out, however, this wasn’t necessarily the case. After facing all three members, you return to the Resistance camp to find the Resistance leader. She’ll tell you, however, that she was unaware of any threat from rogue androids, hinting towards a more duplicitous side to the YoRHa project. The conflict with these units really makes you question your actions as a player. You never truly get the time to understand them fully, but there’s enough evidence to suggest they weren’t deserving of their fate. Robot Cultists Robot Cultists The robot cultists that inhabit the factory ruins are truly fascinating. You come across them while playing as 2B, with your intention being to broker an alliance between Pascal’s village and the religious organisation. However, their world descends into chaos soon after you arrive, when it’s revealed their leader has kicked the bucket. For this reason, the robot cult can be seen as a scathing critique of organized religion and blind faith. 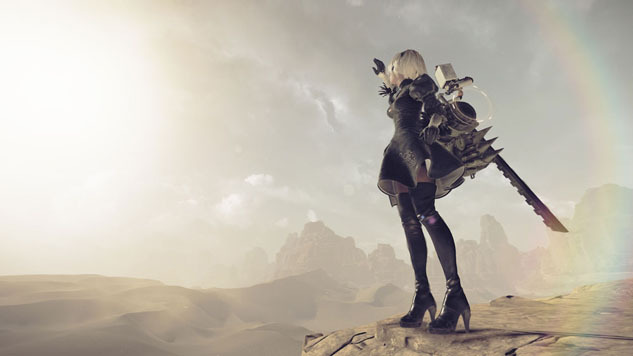 They also happen to be some of the most memorable robots from Nier; Automata and clearly show the developers weren’t afraid to tackle some complex themes within the game’s narrative. Jackass Jackass Jackass is a resistance member who is involved in several quest lines. She enjoys experiments and likes to subject the androids 2B and 9S to different trials, in order to collect data. Perhaps the most notable example of this is when she asks them to eat a Mackerel to see how the oil effects an android’s body. Should you do this, it will result in one of the many ‘joke’ endings of the game, with the android dying as a result. Always a valuable source of information, Jackass is a character worth keeping track of, if you’re interested in completing the many side-quests the game has to offer. Father Servo Father Servo Father Servo is situated on top of a building close to the entrance of the desert camp. He’s a follower of the warrior’s path and uses the player to become stronger, goading them to bring him spare parts to augment his form. After each improvement, he’ll task the player with defeating him, testing his newfound strength. He’s yet another example of a machine with a distinct personality and provides some fun fighting challenges for the player to overcome. Robot Acting Troupe Robot Acting Troupe Romeo & Juliet is already a violent production. It involves murder, suicide and betrayal. Yet somehow the version that’s performed by the amusement park robots in Nier: Automata manages to be even more vicious. Should you revisit the theatre after defeating the Opera Singer, you’ll be treated to a spectacular production where Romeo and Juliet beat each other into bolts and scrap metal. It’s a highly amusing scene that’s elevated by the wonderfully misguided performances from the acting troupe. Operator 6O & 210 Operator 6O & 210 When deployed in the field, you’re supported by the androids Operator 6O and Operator 210. These characters have drastically different personalities. For example, 6O is vibrant, friendly and isn’t afraid to share personal details about herself. 210, on the other hand, is stern and officious. It’s this juxtaposition of extremes that helps them stand out among the cast of characters. Animal-Loving Machine Framed initially as an enemy, the Animal-Loving Machine will surrender after you do enough damage to him. He’ll then plead for you to spare his pet animal who’s on the verge of death. Should you choose to let it live, the machine will then befriend you, telling you to visit anytime. If you do, he’ll task you with carrying out some additional chores to look after the creatures of the forest. Jean-Paul Jean-Paul Jean Paul is a resident of Pascal’s Village of peaceful robots. Named after the philosopher Jean-Paul Sartre, he has many admirers who try to win his favour as part of the Jean Paul’s Melancholy quest, but he’s uninterested and often incredibly harsh towards them. In spite of this, his followers remain devout, captivated by his ramblings about existentialism and his shunning of material goods. Commander Commander The director of YoRHA, the Commander is in charge of the Bunker and responsible for designating tasks to any operatives in the field. She’s level-headed and likes being in control, but this doesn’t stop her from letting her guard down and showing a slight fondness towards 2B and 9S from time to time. Out of all the androids in the game, the Commander likely knows the most about human civilization, given her rank. This fact makes her a necessary point of contact as things take a turn for the worst on Earth. Anemone Anemone Anemone is the leader of the resistance on Earth, tasked with destroying the robots connected to the network. She isn’t necessarily a cold hearted killer though, as can be seen by her willingness to work with peaceful machines. Throughout the game, you’ll bump into Anemone time and time again. She’s a constant source of support and information, as you bounce from location to the next. Pod 153 and Pod 042 Pod 153 and Pod 042 Pod 153 and Pod 042 are two of the most useful characters in the game. They provide long-ranged fire support for 9S, A2, and 2B during enemy encounters, and offer up operational intelligence in the form of helpful hints. These tell you about specific boss weaknesses you can exploit or critical actions that you should consider taking. Ernst the Forest King Ernst the Forest King A group of robots detached from the network, the Forest dwellers form a kingdom in order to protect themselves, exalting one among them named Ernst to the throne. The Forest King’s fate is revealed to the player during the second playthrough as 9S. During this run of the game, you’ll be awarded with new cutscenes that detail Ernst’s ascent to the throne, his death, and his rebirth in the body of a child. It’s an inspired tale and one that helps to add more depth to the world and its inhabitants. It’s also another example of machines replicating human behaviour to a fault, as the King’s subjects fail to move on after his death. Engels Engels Engels is a huge Goliath-class machine, fought throughout Nier: Automata. He resembles a large industrial building and can be found in the City Ruins after being defeated. Here he can be repaired as part of the Machine Examination quests. If you fix him, he’ll become disconnected from the network and ask players to tell him stories or come visit him. Should you do this, he’ll then tell you that his loneliness has forced him to read up on human history and to learn of the devastation that his kind has wrought. This convinces him to try to atone for his crimes by offering his parts up to 2B and 9S as recompense. Simone the Opera Singer Simone the Opera Singer Simone is one of the creepier machines in Nier: Automata. Powered by a desire to be beautiful, she uses other machines to improve her form. Driven by her madness and jealousy of others, she attacks 9S and 2B when encountered in the Amusement Park theatre. It’s here that she meets her eventual downfall. Simone is one of the most creative bosses in the game, and proof of Taro’s ingenuity and his storytelling ability. What could be just a bland villain encounter becomes something much more through only a handful of lines: a tragic meditation on love, self-improvement and rejection. Devola & Popola Devola & Popola Fans of Nier will likely recognize Devola and Popola as the twin sisters from the first game. In Nier: Automata, they return, this time as androids who are ostracized for their past mistakes. It’s this mistreatment by others that leads them to offer assistance to the player, in an attempt to achieve some kind of redemption. Another tragic couple, their story is one of adversity and survival against the odds. Adam & Eve Adam & Eve Adam and Eve are the primary antagonists of Nier: Automata. Their goal is to be as close to human as possible, and to help the robot population evolve, making them enemies of YoRHa. Of the two brothers Adam is the more philosophical, while Eve is an adolescent and motivated primarily by his affection for his older sibling. After Adam is murdered by 2B, Eve cannot fathom life without his brother and is subsequently driven crazy by grief. Taking control of the robot units linked to the network, he sets about wreaking havoc on the Resistance forces on Earth, aiming to get revenge no matter the cost. A2 A2 A2 is the third playable character in the game. She’s also the prototype YoRHa model that inspired both the 2B and 9S models of YoRHa android. Deployed to Earth as part of the first YoRHa squadron, she deserted the organization after seeing all her comrades die and is wanted by them as a result. She has a dislike for following orders and acts as a rogue soldier on Earth, avenging her fallen comrades by killing any machines that she can find. 2B 2B 2B is the main character of Nier: Automata. It’s her role to monitor 9S and help in the fight against the machines. Over the course of the game, 2B’s character changes quite a bit. She goes from a staunch follower of commands to a much more personable figure. This is shown through her relationship with 9S. Initially greeting him with a cold and resolute tone, she eventually warms to him and even starts to use his nickname “Nines”. It’s a sweet relationship that stands out as one of the game’s most endearing attributes. 9S 9S 9S is a scanner model android who’s tasked with helping 2B complete her mission on Earth. Out of all the characters in the game, his transformation is arguably the most pronounced, going from a childish figure who is only concerned with completing the task at hand to a vengeful soul intent on killing all machines. It’s a heartbreaking arc that’s made all the more upsetting by the time you spend alongside the character. Emil Emil Another returning character from Nier, Emil appears in the form of a machine with the body of a rolling cart. His function is to provide help to the player through selling items and upgrading gear, much like the other merchants in the game, but he also holds some story significance. By completing the quest Emil’s Memories, you’ll find out that he’s actually a copy of the original Emil made to fight off the alien invasion. This is revealed by finding several glowing flowers that are spread throughout the game’s world. After failing in repelling the alien threat, his kind were dispersed, with the original Emil disappearing in the process. Pascal Pascal A pacifist robot detached from the network, Pascal greets players after they defeat Simone, inviting them to his village. Ironically one of the most human of the characters in the game, he became a pacifist after he realized the loss that it caused and set up a village to protect other machines from the warring factions. Complex and likeable, his character and dialogue is used to explore both the Just War theory and social responsibility. Nier: Automata has an abundance of robots in it. These range from stubby little animatronics to YoRHa androids to towering Goliaths. Some of these demonstrate a large amount of personality, while others simple exist to provide a shooting gallery for the player or to hand out fetch quests. We’ve decided to take a look at some of the more developed of the bunch, with the aim of ranking them from worst to best. As with any Yoko Taro game, it’s recommended you’ve played the game before you read anything about it to avoid spoiling the experience. Consider this your final warning.